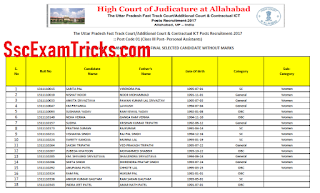 Allahabad High Court Stage II Written Exam Admit Card 2018 – Allahabad High Court Group C D Call Letter Result Merit List Appointment Joining Letter - www.allahabadhighcourt.in. Latest News (18.12.2018) - Allahabad High Court ICT Staff, Personal Assistant Final Result has been declared now. 1. Nothing is required. The result is available in PDF Format. Download the pdf from the link given here. Latest News (16.11.2018) - Allahabad High Court Group D Final Result has been declared now. The good news is that AHC has uploaded Group D 2017 Final Result on official website. The category wise non marks selected candidates list has been uploaded which can be downloaded from the table provided in the end. Allahabad High Court will release online Admit Card about 15-18 days before exam to be held in 2018 at various centers for the posts of. 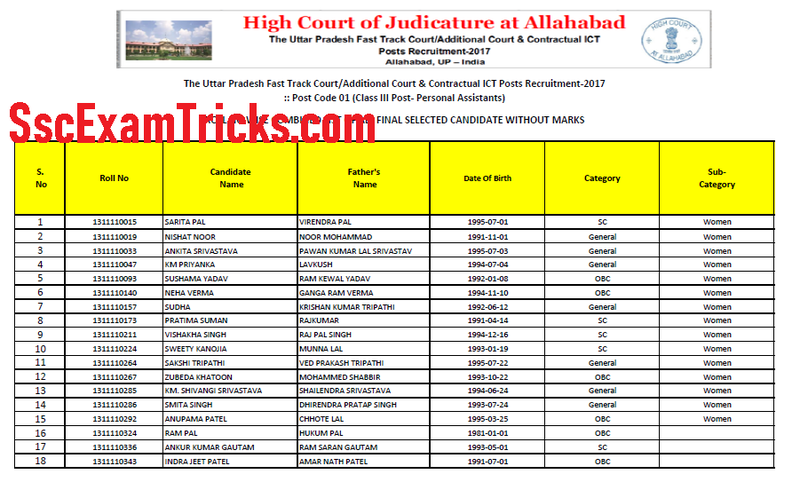 Those candidates who had applied for these posts and waiting for their Allahabad High Court Stage II Call letter 2018; they can download it from direct link given at the end of the page. · Click on Allahabad High Court Stage II Final Result link and enter your registration and date of birth/ password.